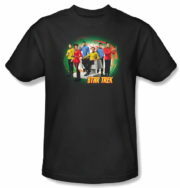 This is a black t-shirt bearing the images of the main cast from the classic original Star Trek TV series. This is a 100% cotton design, new, never worn shirt. Printed by Universe Publishing and distributed by Andrews McMeel Publishing, from the #1 cult television series of all time (TV Guide), the Star Trek 2019 Episodes Posters Wall Calendar features full-color detachable 11″ x 14″ posters. 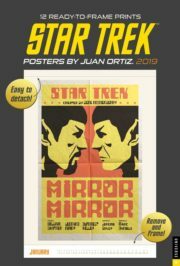 The Star Trek Posters by Juan Ortiz 2019 Poster Calendar features 12 ready-to-frame retro pop artwork inspired by episodes from Star Trek The Original Series by fan favorite Juan Ortiz. This collectible calendar features artwork that celebrates episodes from the sci-fi epic’s first three seasons. All pages are perforated top and bottom for easy removal and framing! This is a new, unused spiral bound 11″ x 16.5″ original shrink wrap copy from the publisher. This 1.75″ wide cloisonne metal pin features an image of an alien Le-Matya as seen in the episode “Yesteryear” on the original classic Star Trek TV Animated Series. It is a new, unused, mint condition pin made by the Hollywood Pins Company in 1990, and now out of production. This is a black t-shirt bearing the images Captain Kirk, Mr. Spock and Doctor McCoy, from the original classic Star Trek TV series, in the transporter and under the phrase “Beam Me The Hell Outta Here!”. This is a new, unworn t-shirt. 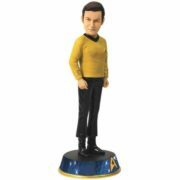 This is a 7.5″ tall ceramic bobble head figurine of the classic TV Star Trek Captain Kirk on a base featuring the classic command logo. Produced by UPG in 2016, this is a magnetic plush finger puppet featuring the image of Captain Kirk from the classic Star Trek TV series. 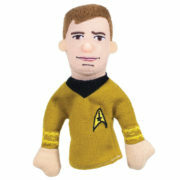 Captain James T. Kirk will command your kitchen as a magnet on your fridge or go where no finger puppet has gone before. Approximately 4″ tall and ready for Star Trek adventures. 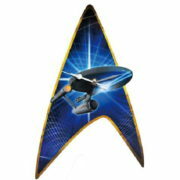 This is a 10.75″ tall desktop standee that features the image of Captain Kirk from the classic Star Trek TV series. It is a pop out stand up protected in shrink wrap. 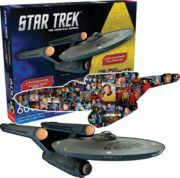 Produced in 2016 this is a boxed set of 14 different classic Star Trek Chibi figures. Energize your 50th anniversary celebration of the legendary Star Trek TV series with this limited edition set of 12 chibi-styled figures of popular classic Trek characters, plus two mystery figures! Chekov! Each card comes with its unique set of sticker sheets filled with greetings, images, and quotes! Produced in 2016 by the Unemployed Philosopher’s Guild comes the classic original TV series Star Trek mints. Whether you’re meeting Mudd’s Women or transporting the Federation ambassador to Eminiar VII, these genuine pink peppermint Dilithium Crystals keep your breath fusion-fresh. Each 4 ounce tin of mints is sealed in an illustrated box. Produced in 2016 by the Unemployed Philosopher’s Guild comes the classic original TV series Star Trek mints. 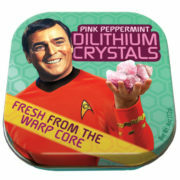 Whether you’re meeting Mudd’s Women or transporting the Federation ambassador to Eminiar VII, these genuine pink peppermint Dilithium Crystals keep your breath fusion-fresh. 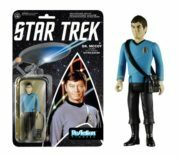 Produced by UPG in 2016, this is a magnetic plush finger puppet featuring the image of Doctor McCoy from the classic Star Trek TV series. Dr. “Bones” McCoy is a doctor, not a bricklayer! He’ll keep you company as a finger puppet when you’re confined to Sickbay, then join the landing party as a magnet on your fridge! Produced in 2015 by Funko, this is part of their ReAction action figure line. This one features the late DeForest Kelley as the classic Star Trek TV series Doctor McCoy “Bones”. It measure 3.75″ high, comes with a removable tri-corder and is a sealed, mint on the card figure with the original punchout still attached. 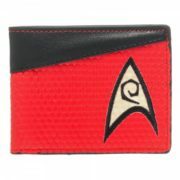 Produced by in 2014, this is a licensed bi-fold red vinyl wallet featuring the classic original Star Trek series engineering patch logo on the front. The wallet measures 4.5″ x 3.5″ closed and has 3 interior pockets plus a picture holder. 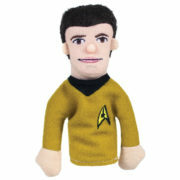 Produced by UPG in 2016, this is a magnetic plush finger puppet featuring the image of Ensign Chekov from the classic Star Trek TV series. As a magnet, Mr. Chekov can navigate your locker or refrigerator. 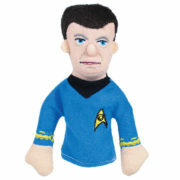 As a finger puppet, he can be acting science officer of your very own episode of Star Trek! 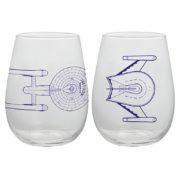 Produced in 2017 this is a set of two contour glass 18 ounce tumblers featuring the image of the classic U.S.S. Enterprise starship on one and a classic Romulan Bird of Prey on the other from the original Star Trek TV series. The classic Star Trek name logo is on the back of each. 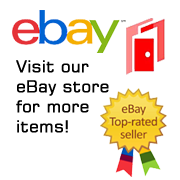 They measure 3.5″ x 3.5″ x 4.5″ high, are new and unused, and ship in an illustrated gift box. This is an unused, mint in the box 600 piece two-sided jigsaw puzzle die cut in the shape of the NCC-1701 Enterprise as seen on Star Trek: The Original Series. 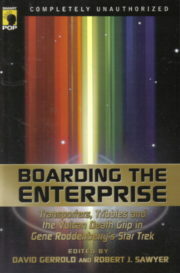 One side features the Enterprise and the other a collage of characters and scenes from the series. Produced in 2014 by Aquarius, it is stock #75008, and measures 11.25″ x 33″ when completed. This is 14″ high 9″ wide cordless wall clock from the classic Star Trek TV series. It is shaped like the command insignia worn on the tunics of the officers aboard the Enterprise with the Enterprise NCC 1701 speeding across middle. It is a new, unused clock that comes in an illustrated box. It runs on a LR1130 cell button battery which is included. It has been stored in a smoke and pet free environment. 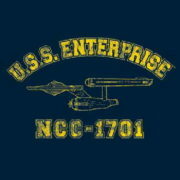 This is a navy blue t-shirt bearing the distressed style diagram image of the classic Star Trek TV series Enterprise between the name and call letters, done as an athletic style shirt. This is a 100% cotton design, new, never worn shirt, available from us for this listing in sizes small, medium, large, 2x-large, and 3x-large. You may choose the size you desire (please contact us with choice) otherwise we will ship size xl. 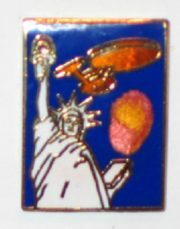 This 1″ high pin features the classic original TV series Enterprise flying over the Statue of Liberty with fireworks in the background. Produced by the original Lincoln Enterprises in the 1980’s, this was one of the few lapel style pins they produced as most of their pins were uniform style pins, and had limited release and is not easily found outside of Star Trek conventions. This is 6.75″ 14.5″ x 1.5″ cordless wall clock from the classic Star Trek TV series. 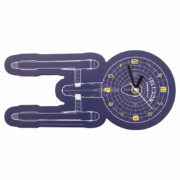 It is a die-cut shape of the Enterprise NCC-1701 with the clock face over the saucer section. It is a new, unused clock that comes in an illustrated open faced box. It runs on 1 AA battery which and is stored in a smoke and pet free environment. 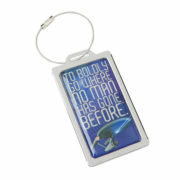 Produced in 2009 and no longer being made, this is a 2″ x 3.5″ blue stainless metal luggage tag featuring the classic TV Enterprise under the opening TV intro phrase “To boldly go where no man has gone before”.